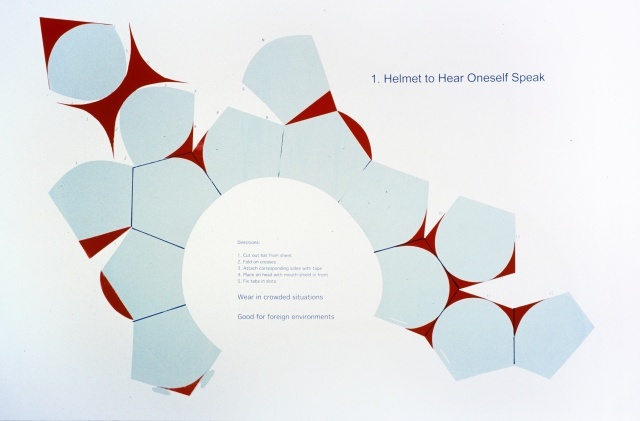 Paper helmet print comes flat as a pattern with instructions for use. When flat, the Helmet for Speaking to Oneself becomes much more conceptualized. The viewer must make choices about treating the piece as a limited edition art piece, destroying a stage of its existence if it is cut out and constructed. The reverse side of the paper is printed a dark blue that becomes the inside of the Helmet when constructed. Useful in foreign environments or crowded situations. Also good for over zealous cell phone communicators. 4 pieces remaining in uncut print form in edition.